Casio has announced an addition to the Exilim Outdoor Recorder line with a model that is designed to take stills and video in extremely dark conditions. The EX-FR110H uses a back-illuminated CMOS sensor with 1.9 million extra-large pixels that Casio claims are better at recording light when there isn’t much of it around. Aimed at cavers, campers and those who enjoy a night safari the camera offers ISO 51200 and new noise suppression circuitry as well as a high speed Exilim engine HS ver.3. The camera features an F2.8 lens with the angle of view of a 20mm on a full frame camera, while the 3″ LCD screen has a special setting for working in very low light. The camera follows the detachable format of the FR series so that the body and the lens unit can be separated for remote capture with feature control maintained via Bluetooth. Casio says the camera is drop-, water-, freeze- and dust-proof, and that it can record Full HD video at 30fps and with 3 stops of stabilization. Despite the camera’s low-light credentials, in the product information Casio helpfully points out that you can’t take pictures in the absence of light. 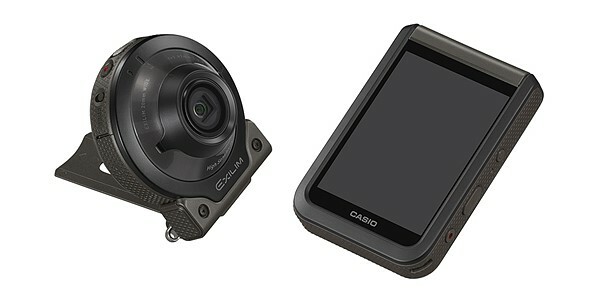 The Casio Exilim FR110H will be an Asia-only product, and will be released for sale on 9th December. For more information see this translation of the Casio product page.